A UCL academic delegation led by UCL President & Provost Professor Michael Arthur and Vice-Provost (International) Dame Nicola Brewer travelled to India last week, visiting global partners including the All India Institute of Medical Sciences (AIIMS) and the Indian Institute of Technology Delhi (IIT-Delhi), in a trip which consolidated UCL’s wide-ranging research and teaching collaborations in the country and explored future areas for collaboration. As part of the visit, members of the UCL delegation met with counterparts including Professor V Ramgopal Rao at IIT-Delhi, an institution with which UCL holds a number of strong and longstanding research collaborations. Among these is the ‘Participatory Approach for Nutrition in Children: Strengthening Health, Education, Environment and Engineering Linkage’ (PANChSHEEEL) Project, which aims to improve child nutrition. Focused on infant feeding practices and working closely with local rural communities, PANChSHEEEL is co-led by Professor Monica Lakhanpaul (UCL Institute of Education) alongside Dr Priti Parikh (UCL Civil, Environmental & Geomatic Engineering) and Professor Marie Lall (UCL Institute of Education), with partners including Save the Children and Jawaharlal Nehru University. “Through this interdisciplinary project we assessed the environmental and engineering factors affecting nutrition. We found that clean water and safe sanitation systems has a vital role to play,” said Professor Virendra Kumar Vijay (IIT-Delhi). Another collaborative project with IIT-Delhi, Street Rehab, has been designed to gain a clear understanding of the accessibility of Delhi. Researchers with the Global Disability Innovation Hub, led by Dr Catherine Holloway (Global Disability Innovation Hub), are developing wheelchair-accessible maps of Delhi with colleagues in India, using innovative sensing platforms. The visit also saw UCL delegation members, including UCL Vice-Provost (Health) Professor David Lomas, meet with AIIMS. During a successful discussion in New Delhi, the two institutions signed a Letter of Intent to underpin closer partnership that will seek to support increased research collaboration and aim to explore opportunities to increase academic and student exchange between the institutions. 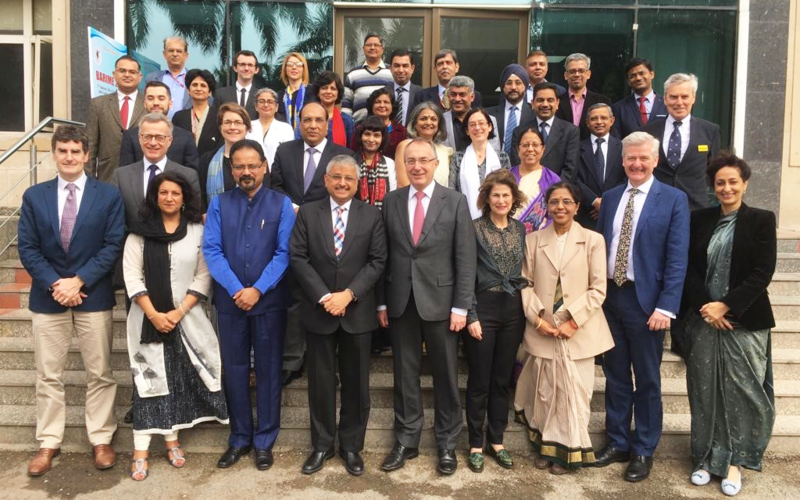 As part of this commitment, AIIMS has joined the new International Centre for Genomic Medicine in Neuromuscular Diseases (ICGMN), led by UCL. This £5m initiative brings together skills and resources from six countries and aims to advance genetic diagnosis and therapy for patients with muscle wasting neuromuscular diseases, including motor neurone disease and muscular dystrophy, which affect at least 17m children and adults globally. The trip also saw the UCL delegation visit the Indian Institute of Astrophysics, with which UCL collaborates on space science and astrophysics research, as well as the Indian Institute of Science in Bangalore where UCL has a strong range of collaboration in statistics, data science and machine learning & neuroscience. UCL has a longstanding relationship with India. There are 100+ collaborations across UCL faculties, addressing challenges in the fields of health, engineering, disability, urbanisation, environment, education and more. Notable UCL alumni from India include Mahatma Gandhi, who registered for UCL (Law) in 1888-89, as well as the Bengali Nobel Laureate and musician Rabindranath Tagore.